Built in the 1650's by Emperor Go-Mizunoo, the Shugaku-in is a set of three villas (upper, middle and lower), each sporting its own garden laid in the imperial style. 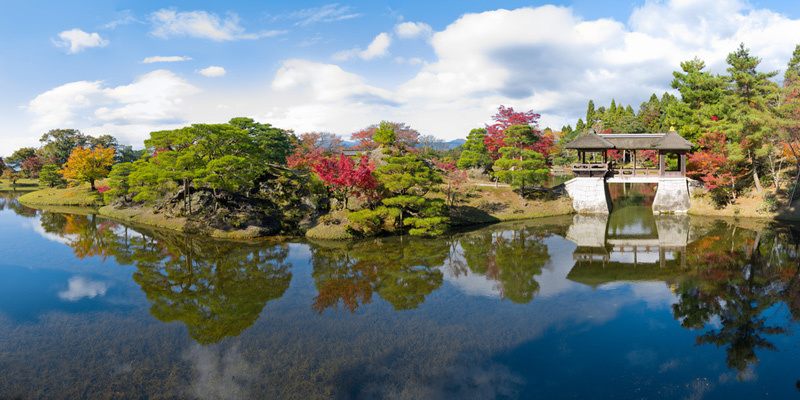 The grounds cover 53 ha (133 acre) and are considered one of the greatest masterpieces of Japanese gardening. Shugakuin is the largest of Kyoto's Imperial villas. The Shugakuin was originally a temple (hence its name), founded in the 10th century, and acquired in 1655 for the construction of a villa for the retired Emperor Go-Mizunoo. In the early Edo era (1600-1867), after decades of turmoil and civil war, Japan had settled in a peaceful and prosperous period under the rule of the Tokugawa shogunate. In 1611, Emperor Go-Mizunoo (1596-1680) ascended the throne at the young age of 15, but soon found his power heavily curtailed by the shogun. In 1627, in the so-called "Purple Clothes Incident", the Emperor was accused of having bestowed honorific purple garments to more than ten priests of the Jōdo sect, despite Shogun Tokugawa Iemitsu's edict banning such garments for religious professions. The priests were promptly sent into exile to Sado Island by the shogun. Himself a follower of the Jōdo sect, the emperor protested, but powerless in front of the shogun, he abdicated in favour of his daughter Okiko. In 1641, the shogun decided to build a villa for the retired emperor and sent agents looking for a suitable site. It is only on 13th March 1655, as Go-Mizunoo passed in the foothills of Mount Hiei, that he opted for this location. The streams flowing down from Mount Hiei would ensure the water supply for the ponds and waterfalls. The Upper and Lower Villas were completed by 1659, though the Middle Villa was not constructed until the 1680s, after Go-Mizunoo's death. The Shugakuin can only be visited by (free) guided tours, which require a reservation at the Imperial Household Agency's office in the Kyoto Imperial Park. During the high season, it is recommended to book tours a few days in advance, as they can get booked out quickly. Note that visitors must be at least 18 years old and should bring their passport for the reservation. You can check the application guidelines on their official website. Tours are held five times a day at 9 am, 10 am, 11 am, 1:30 pm and 3 pm. There are no tours on Sundays and national holidays, and only exceptionally on Saturdays. Tours are only in Japanese, but English audio guides are available. Only the gardens are accessible. As with other Imperial properties, the inside of buildings is off-limits to visitors. The nearest stations are Shugakuin and Takaragaike, both on the Eizan Railway Main Line (叡山電鉄本線). The Imperial Villa is located about 1.3 km (20 minutes walk) east of either station. Coming from Kyoto Station, you should first board a train on the JR Nara Line to Tōfukuji Station (2 min, ¥140), then transfer to the Keihan Line to Demachiyanagi Station (9 min, ¥260), then again to the Eizan Line to Shugakuin Station (7 min, ¥200). Tip: you might want to combine a visit to the Shimogamo Shrine or to the Imperial Palace on the same day as both are at walking distance from Demachiyanagi Station. Shisendo Temple is 20 minutes walk south of Shugaku-in Rikyū and can also be visited the same day.